Following the study plan for SBI PO Preliminary Examination 2018, the sixth week includes practice questions on Puzzles & Seating Arrangement, Input-output, and Inequalities. To ensure proper preparation of the section we advise you to go through all the questions sincerely and try to attempt each one of them. Afterward, match your solutions and the approach with the one that would be provided later. Practice more and more questions on the same section to enhance your grip over the topics. 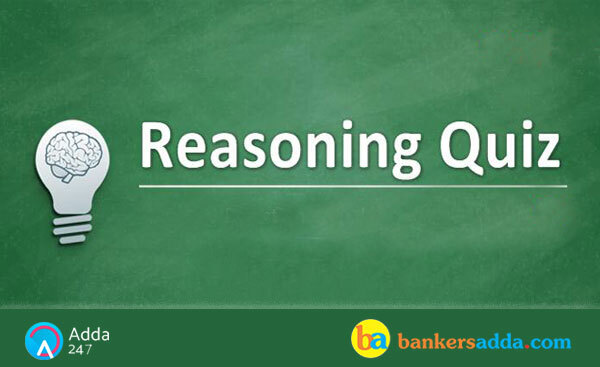 Following is the Reasoning Ability quiz to help you practice with the best of latest pattern questions. There are ten people sitting in two rows such that in row 2 M, N, O, P, Q are sitting and facing in north direction and in row 1 D, E, F, G, H are sitting and facing in south direction and they are of different ages 15, 20, 23, 30, 33, 35, 38, 45 ,49, 50 but not in the same order. No two persons are sitting together according to alphabetical order, except G and F.
There are two people sitting between M and Q and either M or Q is sitting at one of the extreme ends. G is 20 years old and sits third to the left of H. Neither H nor F sits opposite to M and Q, who is not the oldest. The age of P is a multiple of 11. G sits opposite to N whose age is a multiple of 7. Two persons sits between the one who is the youngest and the one who sits opposite to the one whose age is 35. Three person sit between the one whose age is 49 and the one who is the youngest. O’s age is twice the age of H. The age of the person who is facing the person who is sitting 2nd to the left of Q is a prime number . The age of M is equal to the sum of ages of H and O. Only one person is sitting between H and F.
Q1. What is the age of F? Q2. Who among the following is the oldest? Q3. Who among the following sits to the immediate left of E? Q4. Which of the following combination is true regarding the given arrangement? Q5. Who among the following is 33 year old ? (ii). Now according to statement, No two persons are sitting together according to alphabetical order, except G and F, from this case 2 will get eliminated since there is no other place for P and O. O’s age is twice the age of H i.e. H is 15 year old and O is 30 years old. The age of M is equal to the sum of ages of H and O it means M is 45 years old. Three persons sit between the one whose age is 49 and the one who is the youngest as we know H is 15 years old and the youngest so from this E is 49 years old. Two persons sits between the one who is the youngest and the one who sits opposite to the one whose age is 35, so N is 35 years old. (iii). From the rest conditions, The age of P is a multiple of 11, so P is 33 year old. Q, who is not the oldest means Q is not 50 years old, so Q is 38 and D is 50 years old. Hence, we will get the final solution. ‘P # Q’ means ‘P is not greater than Q’. ‘P % Q’ means ‘P is neither greater than nor equal to Q’. ‘P * Q’ means ‘P is neither smaller than nor greater than Q’. Now in each of the following questions assuming the given statements to be true, find which of the three conclusions I, II and III given below them is/are definitely true and give your answer accordingly. Directions (11-15): Study the following information and answer the questions. And Step VI is the last step of the above arrangement as the intended arrangement is obtained. As per the rules followed in the given steps find out the appropriate steps for the given input. Q11. How many steps will be required to complete the given rearrangement? Q12. Which of the following is the sixth element from the left in step V? Q13. Which of the following is Step II of the given input? Q14. Which element is third to the right of ‘16’ in step III? Q15. Which element is fourth to the left of ‘rice’ in step V? The machine rearranges one word and one number in each step simultaneously, words are arranged from right end and numbers are arranged from left end. (i) In this, words are arranged according to alphabet series from right. In step 1, the smallest word according to alphabetical series goes to the right end and in step 2 the second smallest word goes to the right end. The word which arranged in 1st step will shift one place left in second step and so on until the final step. (ii) Numbers are arranged in increasing order, In step 1 the largest number goes to the left end and in step 2 the second largest number goes to the left end. The number which arranged in 1st shift will shift one place right in second step and so on until the final step.